Traveling alone or with family and friends and our 10:30 Daily Tour doesn't match your schedule? Have you just moved to Frankfurt and would like an orientation tour to help you get settled, learn how to use the public transportation and find all the stores you need? Would you like us to plan a personalized or themed tour for you or your group? 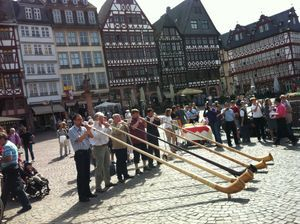 Our Private Tours offer you the chance to see Frankfurt at its' best and at a reasonable, affordable price. We will meet you in the city at the time and place of your choosing, in your hotel lobby, at the main train station (Hauptbahnhof), or any other central location that you prefer. We can show you all the charms of the city, places that you wouldn't find with just a map or a guidebook or sitting on a tour bus! We are a green business, using only public transportation and walking. How does it work? Simply fill in the request form below, and we will do everything we can to accommodate your schedule and tour ideas. Our private tour prices are 55 € per hour for groups of 1 - 10, with a 2 hour minimum booking. This is a total price and not a per person price. If your group is 11 - 20 people, the price is 65 € per hour. Payment is cash only on the day of the tour or by invoice. If you would like the guide to meet you at a hotel that is not in the city center, we will let you know how much public transportation costs will be and help you get a ticket on the day of the tour, but with the addition of travel costs and time for the guide added to the price of the tour. Please fill in all the necessary fields, and we will write back to you as soon as possible, with instructions on how to confirm your booking, how to pay your 25 € deposit, where we will meet you, and answer any questions you might have about the tours or Frankfurt itself. We answer all tour requests within 24 hours, but if you have not heard from us, that means one of 2 things. Our email to you may be in your spam/junk folder, especially if you have a hotmail account, or there may have been a typo mistake on your email address. Please check your folders, write to us again and let us know. This has occurred several times recently and it was not possible to get in touch with the requester. If you would like a specialized tour of Frankfurt, a tour to another town or the Rhine, please let us know what your interests are and we will plan a personalized tour for you. If you would like us to meet you at the airport, please fill out our Layover Tour request form instead of this one.